I read today about Doob h-transforms in the Rogers-Williams … It is done quite quickly in the book so that I decided to practice on some simple examples to see how this works. In fact, we could take any function that satisfies this equality and define a new Markovian kernel and study the associated Markov process. That’s what people usually do by the way. Remark 1 we almost never know explicitly the quantity , except in some extremely simple cases ! Notice how this behaves while : if at the Markov chain is in state then the intensity of jump from to is equivalent to . The volatility function remains the same while an additional drift shows up. This might not be the best way to simulate a Brownian bridge though! If we Taylor expand the additonal drift, it can be seen that this term behaves exactly as in the case of the Brownian bridge. 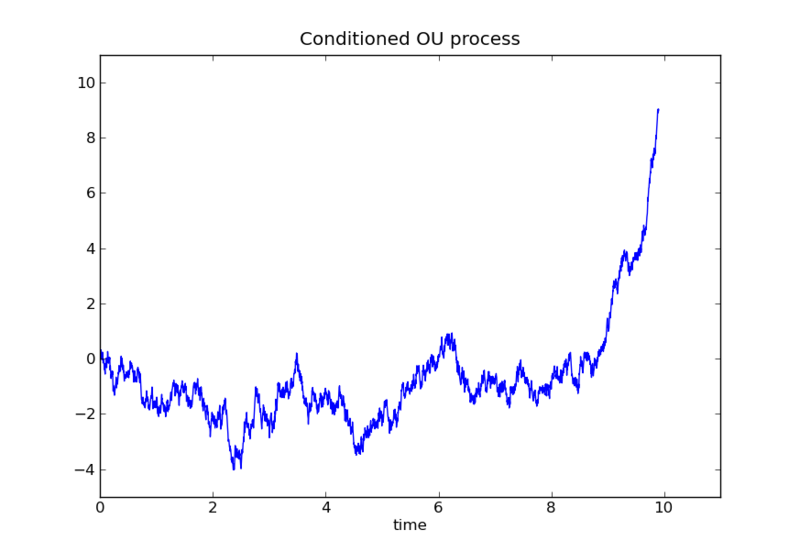 Below is a plot of an O-U process conditioned on the event , starting from .